This post brought to you by www.smokiesrentdirect.com. Stay in the Mountain Tower on your next visit to the Smokies. It is located right between Pigeon Forge and Gatlinburg. It looks like even in this tougher economy, at least one new attraction is opening in Pigeon Forge. 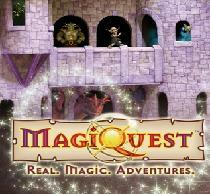 I’ve never visited MagiQuest, but I’ve seen it in one of our trips to Myrtle Beach. It looks like a blast. From what I gather, you use wands and other items to play inside a huge game that you walk around in. I’m sure the kids would love it. Anyhow, today they are holding their grand opening. Personally, I don’t drink, so this wouldn’t really impact me one way or the other. However, I love elections, as it’s great to see freedom at work. This week voters in Pigeon Forge decided NOT to allow liquor by the drink in their city. I got a kick out of all the comments at the bottom of the page. That’s usually where the good stuff on the internet is anyhow (the comments.) Some folks have no class, and it shows in their comments online, LOL. Anyhow, speaking of comments… what do you think? Leave a comment below! Ok, so initially the article below caught my eye because it mentioned the 1982 World’s Fair in Knoxville. My parents brought me to the World’s Fair, and it is one of my earliest memories. It was also probably one of my first trips to the Smoky Mountains. I was 8 years old. I remember riding the World’s Largest Ferris Wheel and the World’s Smallest Water Log ride. I was scared to death of the Water Log Ride. My parents made me ride that before I could go on the Ferris Wheel. I’m glad they did, because I’ve loved Water Log Rides ever since. Anyhow, an interesting suggestion was brought up in the article, building a monorail in the Smoky Mountains. That’s an idea I don’t recall hearing before. It would help with traffic some, and I know personally I would probably try the monorail, but I doubt I’ll ride a bus. The monorail would be much more reliable, and no matter what the traffic is like, they usually run like clockwork. The number of people who would probably use a monorail might make it doable as well. Heck, a side benefit would be, you could hike from one monorail “station” to another without having to bring a car at all. I know that’s something hikers have to keep in mind. With a monorail, that would not be the same issue. Probably the biggest issues with a monorail would be cost and appearance. I would imagine something like this would cost possibly up to billions. I’m not a monorail expert, but considering the terrain, I would imagine it would cost as much or more to do a monorail in the Smokies as anywhere else. As far as appearance, I think that’s an issue that should be looked at as well. A monorail in the Smokies would need to be built to NOT stand out as much as possible. I would also think the amount of rail line INSIDE the park should be kept to a minimum. Perhaps it could be built around the outer edge of the park, and have a couple of lines that go into the park to higher-impact areas. With the whole “going green” thing being such a focus, it looks like now would be as good a time as any to consider something like this. This could even be a way for Sevierville/Pigeon Forge/Gatlinburg/Dollywood to cut back on traffic, or at least increase capacity of their cities while not increasing how many people that appear to be visiting the area. Perhaps it could be elevated above the current roads, which might help keep it from being too obtrusive. It definately works well for Disney. I know the times I’ve been to Disney, we’ve used the monorail any chance we got. So what do YOU think?? Reply in the comment section below! PIGEON FORGE, Tenn. (April 2009)—The ever-expanding Duggar family, stars of TLC’s “18 Kids and Counting,” is coming to Pigeon Forge May 5 –9 to explore what entertainment legend Dolly Parton and more than 10 million annual visitors already know—this Smoky Mountains town is ideal for families of all kinds. “Just when you thought Pigeon Forge had everything, along come the Duggars,” said Mayor Keith Whaley. At the invitation of Mayor Whaley, the Duggars will travel 750 miles from their hometown of Springdale, Ark., to participate in the upcoming Dolly Parton Homecoming Parade on May 8 and take in the many sights of this major tourist town. The Duggar family trip to Pigeon Forge will be featured in a summer episode of “18 Kids and Counting,” which airs on TLC Tuesdays at 9 p.m. (ET/PT). Each episode chronicles the lives of an Arkansas couple, Jim Bob and Michele Duggar, and their 18 natural-born children, who range in age from four months to 21 years. The family includes two sets of twins. For more information, visit TLC.com. Every year for the past 24 parades, thousands of Dolly Parton fans have lined a two-mile stretch of the Pigeon Forge Parkway to wave at and to be acknowledged by the entertainment superstar. Parton, of course, is the grand marshal. She is tied to the local tourism economy because of Dollywood, the theme park that is Tennessee’s most popular ticketed attraction. This year’s Dolly Parton Homecoming Parade has special meaning because Parton is the official ambassador of the 75th anniversary of neighboring Great Smoky Mountains National Park, and the parade is expected to carry an appropriate theme. Details of Parton’s float are a tightly held secret, a tradition throughout the parade’s history. The Duggars will participate with an honorary float the City of Pigeon Forge has crafted for them. Great Smoky Mountains National Park, whose nine million visitors make it the most visited of all national parks, has adopted six Pigeon Forge special events, including the parade, into its official anniversary celebration. In days leading up to and following the parade, the family will enjoy numerous Parkway attractions during their five-day stay, including several live comedy and musical theaters, spiraling three-story go-cart tracks and North America’s only Zorb, the mountain-side free-fall inside a gigantic ball. All told, Pigeon Forge boasts more than 40 family-friendly attractions along its five-mile Parkway, making it one of the most popular tourist destinations in America. Complete information about Pigeon Forge attractions and travel itineraries can be found online at www.MyPigeonForge.com or by calling toll-free to 1-800-251-9100. The Dolly Parton Homecoming Parade starts at 6 p.m. on May 8 near Traffic Light #6 and travels north nearly two miles to Traffic Light #3 in Pigeon Forge, Tenn. Organizers encourage visitors to arrive in Pigeon Forge early in order to acclimate to the city and find Parkway space from which to view the parade. Pigeon Forge, located in East Tennessee near Great Smoky Mountains National Park, is one of the country’s top tourism destinations drawing more than 11 million visitors each year. With more than 40 family-friendly attractions along its five-mile Parkway, Pigeon Forge is clean family fun for all ages. The destination city is located within a day’s drive of two-thirds of the U.S. population east of the Mississippi River. TLC’s innovative docu-series and reality-based programming include favorites Jon & Kate Plus 8, Little People, Big World, What Not to Wear, 18 Kids and Counting, and LA Ink. TLC defined home design with Trading Spaces and continues to renovate the genre. TLC’s daytime lineup includes the Emmy Award-winning A Baby Story. The channel is available in more than 97 million homes in the US, nearly 8 million homes in Canada and through the website at www.tlc.com. TLC is part of Discovery Communications (NASDAQ: DISCA, DISCB, DISCK), the world’s number one nonfiction media company reaching more than 1.5 billion cumulative subscribers in over 170 countries. This video from @AshvilleNews on twitter. A great little 3 minuts trip to Dollywood. Enjoy!